Firmware version QTS 4.3.3.0188 was loaded onto the TS-453B-4G and performance tests were run using the Revision 5 NAS test process. All tests were run using Western Digital Red 1 TB (WD10EFRX) (x4 SNB supplied). For testing, the optional QNAP LAN-10G2SF-MLX adapter was installed in the TS-453B. A 10Gtek x520DAI card with Intel 3.9.58.9101 driver was added to the NAS testbed for the 10 GbE tests. We're going to focus on the TS-453B's 10 GbE performance because most of today's NASes can saturate a single Gigabit Ethernet connection when transferring large sequential files and the TS-453B is no exception. Although 10 GbE will cost more for both NAS and client, this method supports higher throughput with a single client, with no link aggregation required. The benchmark summary below shows the results for a single client using a Gigabit connection. As expected., the benchmark summary shows that both NASes came close to saturating the 1 GbE connection for file copy read and write operations. Interestingly, however, the TS-431X outperformed the TS-453B in both the NASPT Directory Copy to NAS and the NASPT Office Productivity tests for all RAID levels. In addition, the TS-453B underperformed the TS-431X for RAID 5 for both the HD Playback & Record and the 4X HD Playback tests. To get a feel for how the nine 10 GbE products in our charts performed, I created a chart for 10 GbE RAID 5 File Copy Write and 10 GbE RAID 5 File Copy read. For File Copy Write, the TS-453B was just slightly faster than the TS-431X. Both NASes fell well short of the 600+ MB/s performance turned in by the top four NASes. For File Copy Read, the QNAP TS-453B was about 10% faster than the TS-431X. Both placed at the bottom of the chart. The benchmark summary composite chart below shows only the 10 GbE test results run using a single 10 GbE client. The chart shows both NASes turned in very similar results for all RAID levels for File Copy Write performance. In general, the TS-453B-4G outperformed the TS431X-2G with a couple of exceptions. For the RAID 0 and RAID 10, on the 10 GbE NASPT File Copy From NAS tests, the TS-431X-2G outperformed the TS-453B-4G. Additionally, the TS-431X outperformed the TS-453B for 10 GbE RAID 0 File Copy Read and Write tests. The Total NAS ranking takes into consideration both performance on Gigabit Ethernet as well as 10 GbE. In addition, the charts now show a 10 GbE Total NAS ranking which takes into account only 10 GbE performance tests. As always, the full results of all tests for each individual product are available in the benchmark summary for each product. Since there are only nine (eight shown) NASes that have been tested with 10 GbE so far, I decided to leave the results sorted by Rank. 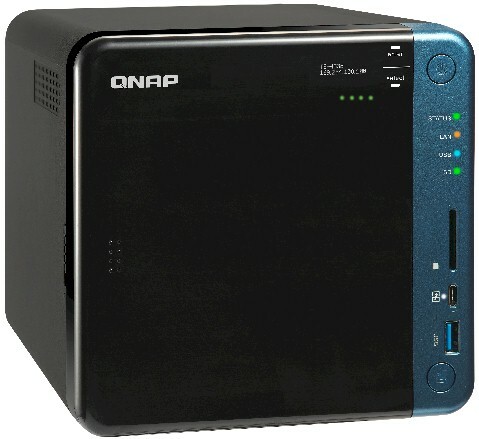 The NAS Ranker shows that based on performance, the QNAP TS-453B-4G ranks #6, just behind its less expensive TS-431X-2G sibling. Turning to the Ranker Performance Summary, you'll find that there's lots of data in the composite chart below. Looking first at the Gigabit Ethernet results near the top of the chart, the TS-431X-2G had better category rankings than the TS-453B-4G for for Read/Write and video categories. The NASes had category ties for Backup and iSCSI. For the 10 GbE only performance, the story is slightly different. The TS-453B-4G edged out the TS-431x-2G with a Total NAS ranking of #5. The TS-431X ranked #6. The TS-453B had better category scores for every category than the TS-431X. The TS-431X outperformed the TS-453B in most categories for benchmarks using a 1 gigabit connection. However, for 10 GbE performance, the TS453B had a slight edge in all categories. But there's a huge difference in pricing. The TS-431X-2G is currently $382 including 10 GbE (SFP+) capability, while the TS-453B-4G is $709 not including QNAP's optional LAN-10G2SF-MLX dual-port 10GbE SFP+ adapter ($399) card. The real differences between the two NASes can be easily seen by looking at the feature chart at the top of the review. The TS-453B is designed to be used in a multimedia environment. It features two 4K HDMI ports, includes an IR remote and has the horsepower to do on-the-fly transcoding for 4K video. It also has an SD card slot, two more USB 3.0 ports than the TS-431X and a USB Type-C port. The PCIe slot on the TS-453B provides many options, including multiple 10 GbE connectivity options, SSD caching and even wireless connectivity. The TS-431X does not have a PCIe slot. Bottom line, if you're just looking for a 10 GbE-capable NAS intend to use it only for storage and don't care about PCIe-based expansion options, the TS-431X is a much better value. If you plan to use your NAS for multimedia, the TS-453B is a good, although much more expensive, choice.